When your design is in need of precise lines, shapes, measurements and scaling - all the things that allow you to keep those real-life dimensions and estimates accurate - our Precision tools have you covered. If you tap the Precision button on the canvas, you’ll see some options expand beneath the menu - Grid, Snap, Measure and Guide. We’ll also discuss setting Scale to your drawings and plans. The grid is a smart underlayment to your canvas that allows you to not only visually use the grid, but interact with it via Snap. Tap the circular button beside Grid to turn it on or off. Touch the label to the left of the Grid button (i.e. isometric) to bring up the Workspace menu and choose a different grid. For help lining up your stroke ends without excess squinting or trouble, Snap auto-connects your stroke’s end-caps to nearby points on the grid or sketch. Tap the circular button beside Snap to enable it. You’ll see an Options label to the left - touch it to bring up multiple options which can be active simultaneously. Key Points - Snap to significant points on the canvas or shape guides. Grid - Snap to points on the grid. Autocomplete - Connects start and end-points of your strokes. You may see small circles appear showing you possible points to connect to - tap one if it’s useful or ignore them if not. Layers - Activate this to Snap to points only inside the active layer, or de-activate to apply to all layers. When you Select a previously drawn stroke, you can adjust it using Snap. With single-stroke selections, Snap points are the beginning and end-points of any given line. With multi-stroke selections, Snap applies to the four corners and the center point. When used with Shape Guides, Snap applies to the handles and the center point. When Measure is active, you’ll see real-world measurements appear beside your strokes. The units and Scale of these measurements are based on your current app Settings. Choose points, units as defined by your iPad settings (may read as inches or metric), inches (Feet & Inches), metric units, or specify your exact desired unit you’d prefer your measurements to appear as (pixels, feet, centimeters etc). An example of measurements labeling an interior layout. To keep those measurements on screen, tap the measurement tag to make it stick to the canvas. Note that it will only appear and Export with your drawing while Measure is active. Entering a custom measurement value. Select a stroke and then tap+hold a measurement tag to enter a custom length. It will change the length of your line to be the value you entered. You can also change the length of the selection by tap+holding the length indicator up in the status bar. Tap+hold+drag a measurement tag to reposition it along your drawn line. Applying measurements using the Line guide. 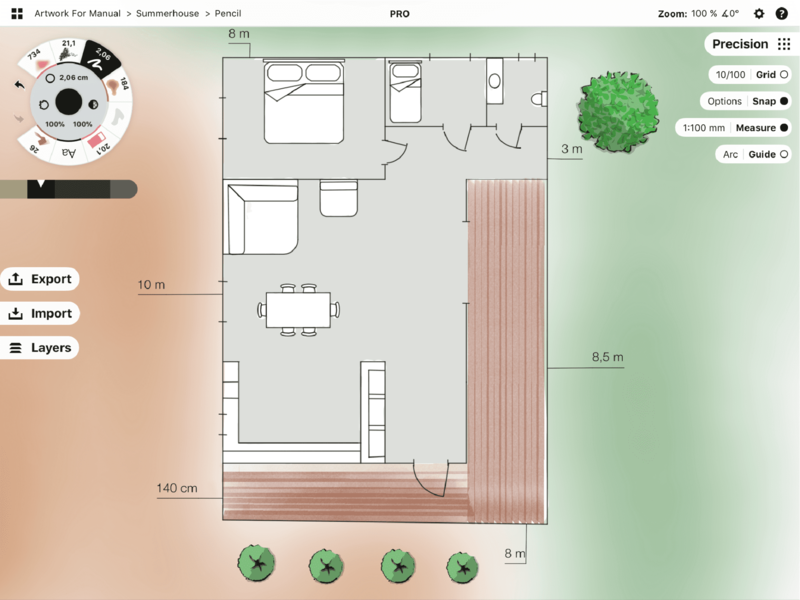 Measure is also useful when working with the Shape Guides to help your design plans retain exact dimensions. Enter a custom value with a tap+hold on the measurement tag, and the entire guide will adjust to your value. Specify the length of the side of a rectangle, and the rectangle will adjust accordingly. Tap+hold the radius of your circle and enter a value, and the circle will adjust likewise. The same applies to any value of any shape guide, including angles. You can also create floating measurements that aren’t attached to any stroke in your drawing. Read more in the Shape Guides section. Scale is a multiplier that defines how big an object is in real life as compared to its size on screen. Popular scales for model airplanes, for example, are 1:24 or 1:72, which indicates that the drawing is 1/72nd of the real size. The Workspace tab of the Settings menu will appear - find Drawing Scale and tap one of the popular scale shortcuts or enter your own scale. Be sure to set your Units at the same time, just below Drawing Scale, or it will revert to your Units set. At 100% zoom level, a 1:1 ratio on the iPad is true-to-life. Place a ruler on the screen and 1:1 in will actually be 1 inch both on ruler and on screen. From this point onward, all tool and measurement values will appear according to this scale, so don’t be surprised when a pen set to 2 points is suddenly .015 inches. Your tool presets will be the same as you’ve set, only the units will be converted. 1. To set scale in a project, you need one accurate measurement of your real space.Take out your tape measure or ruler, and measure one actual length of a wall or section represented on your plan. It doesn’t matter which one it is, so long as it’s clear and easy to mark on your screen. 3. Turn on Precision, and activate Measure. 4. Activate the Line guide, and align the handles on your plan to the same segment of wall or other item that you measured in real life. 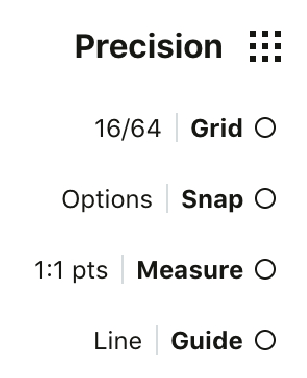 It helps to double-tap the crosshairs at the center of the Line guide, to contain the boundaries of the line to your measurement when you draw. 5. Tap the 1:1 ratio beside Measure. You’ll notice the values under Drawing Scale have been filled in with the current length of the Line guide according to your current units, scale and zoom level. 6. Enter your real-life measurement in the second field, and tap anywhere to dismiss the menu. Now when you look at the ratio beside the Measure button on canvas, you’ll see a new ratio - 1:your-new-calculated-value. This will remain the same regardless of zoom level, and regardless of how much you shrink or expand your Line guide. The Shape Guides are your design-sketching friend. Different from pre-set stamps like Objects (which do work with Measure when on but not to the same level of control), the Shape Guides give you precision control over every edge and radius you draw. Use them to sketch partial or complete perfect shapes, and adjust them to any size, shape or angle. When you activate a Shape Guide, you’ll see a number of features appear. The shape of the guide itself. The gray boundary is a reflection of the brush you’re using - narrow or fat - and is the area that will fill when you trace the shape. Trace anywhere on screen to draw the shape. The circles or handles of the guide. Touch a handle and pull it, and watch the shape stretch or shrink accordingly. The Line guide will limit your drawn stroke to between the handles. The Arc tool will become a perfect half-circle. The Angle tool will snap to 90 degrees. The Ellipse tool will become a perfect circle. The Rectangle tool will become a perfect square. The Shape Guides are really powerful when combined with Measure. If you have both enabled, you can draw lines and other shapes with precise measures and angles. You can see the Measure labels on your guide and tap them to stick them to your plan. (As long as Measure is active, they’ll export with your plan, too.) Tap+hold them to edit the values via keyboard. You can also use Shape Guides to create floating measurements that aren't attached to a stroke or group for more general use, like adding a scale indicator on the drawing. To do this, just tap the measurement and it will stay on your canvas. You can Select the label and move it around, and scale it like any other stroke.